I had a great time on the SWMOA Membrane Tour last week, Thursday, October 8th, 2015. 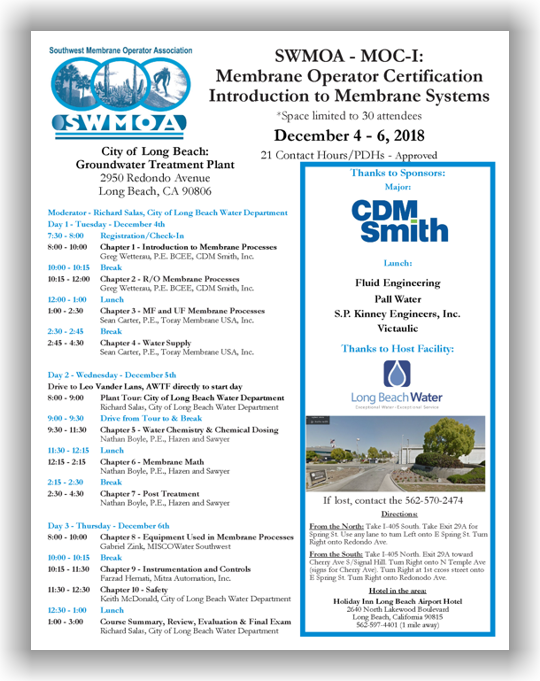 Our Facility is running a pilot for potable reuse and it was great to get insight on how the membranes are made and how they can be tested and examined. It gave me great information to pass on to not only my operators, but the public on the technology behind the process. The cut away of the RO membrane from Toray is a great prop for our tours! I hope there are more opportunities for tours and workshops like this one so I can send my operators and they can see how these facilities are run and how the membranes are constructed. SWMOA staff was excellent in providing food and transportation and keeping us hydrated. Thank you so much! Just wanted to let you know this workshop was one of the best to date. It gave an in depth perspective on the equipment and chemicals we use every day. As operators we are the end user. To see first hand how the manufacturing is started and what goes into keeping the maximum life of our membranes is invaluable. I hope we can get some of the other manufacturers on board. Thanks again for all your hard work setting these functions up.